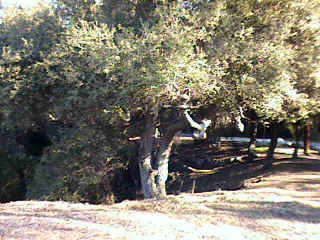 Anyone who really knows the Arroyo Seco knows that there are little and big treasures found all along its course. There are pieces of history and nature unparalleled in our region. Unfortunately often these treasures have been neglected. The Arroyo Brigade, including Barbara Dahn, Gary Cowles, Roy Begley, and Ray Dashner, have been discovering and restoring many of these treasures for several years now. They have found forgotten trails, overgrown paths, hidden springs, and historical remnants. We've previously featured their discoveries in the Volunteer section of this website. Here's their report on their latest breathtaking discoveries. 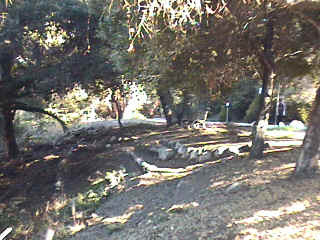 "For the past four weeks, the "Arroyo Brigade" (that's us), have uncovered a unique mini-park at the N.E. 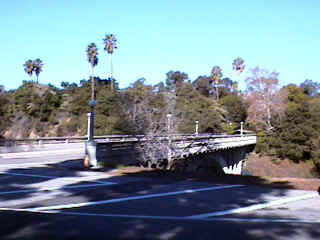 corner of the San Rafael Bridge at S. Arroyo Blvd. "Neglected for what appears to be decades, stone walkways have been discovered under literally tons of debris and discards. A natural grove with a view of the San Rafael Bridge and west canyon wall has been cleared of tangles of weeds, tree branches, wild vines and shrubs. "A haven for transients, unseen by passersby, was cleared of hundreds of abandoned articles. Weeds, tree branches and debris forcing joggers to use the pavement have been cleared allowing use of the restored path. Arroyo stone walls unseen for many years are now being excavated. 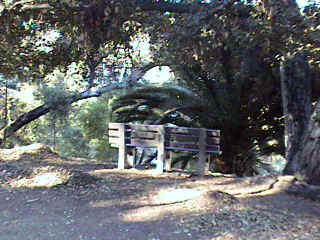 "A virtually unused park bench was cleaned and will be repainted. "We invite you to visit and see what we have accomplished thus far. This is the result of an effort by four volunteers, Barbara Dahn, Gary Cowles, Roy Begley and Ray Dashner. "We ponder the question as to how this City could possibly be so neglectful of it's own treasures."